The Florida Gators and Georgia Bulldogs each won Female Athlete of the Week Honors for the SEC Conference for the week preceding January 7th. Gator senior Hilda Luthersdottir was named the Female Swimmer of the Week, Georgia senior Laura Ryan was named the Female Diver of the Week, and Georgia’s Rachel Zilinskas was named the Female Freshman of the Week. For the Icelandic-born Luthersdottir, this award is an appropriate one in her final year as a Gator. 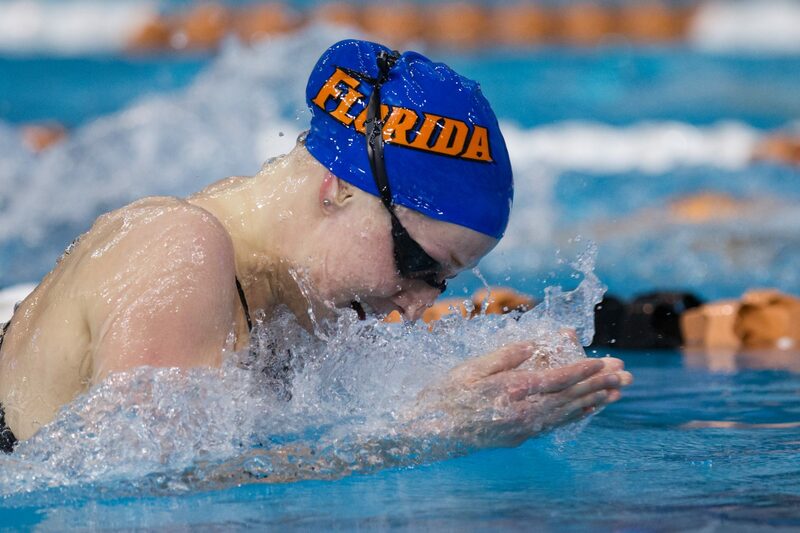 As the team’s best breaststroker, by far this season, there is a lot of hope put on her for both the medley relays and individual scoring as the Gators look toward a possible national championship. She’s lived up to that so far, having been lifetime bests in both distances this year. That continued against Florida State, as she won a very-tight 100 breaststroke over Sami Pochowski in 1:02.96, and followed that up with a 200 win in 2:17.09. Zilinskas, who is primarily a distance swimmer, won the 500 freestyle in a time of 4:50.80 against North Carolina State on Saturday as the Bulldog women gave head coach Jack Bauerle his 500th career win. She was the only Georgia freshman to win an event at that meet, though NC State’s Natalie Labonge and Lydia Jones were both freshman winners at that meet. On the boards, Ryan won the 3-meter and was 2nd on the 1-meter at the Georgia Diving Invite. She also won the 1-meter “shootout” event, and also won the 1-meter as a part of Georgia’s dual-meet victory. A full listing of the athletes’ accomplishments over the weekend are below, courtesy of the SEC. • Won the shorter of the breaststroke events (1:02.96) by out-touching FSU’s Sami Pochowski by .03. • Returned to the pool to win the 200 breaststroke in a time of 2:17.09. • Her 200 breaststroke win and Elizabeth Beisel’s 200 backstroke win stopped a three-event win streak for FSU and returned the momentum to the Gators. • Teamed with Sinead Russell, Ellese Zalewski and Natalie Hinds to win the 400 medley relay in 3:42.27. 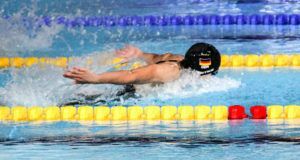 Her 1:01.84 breaststroke leg was the fastest in the field. 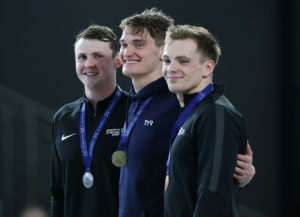 • In the Georgia Diving Invitational, Ryan placed first on 3-meter and second on 1-meter. • Rolled up 332.40 points on 3-meter to take top honors. • Had 305.70 points to come in as the runner-up on 1-meter. • Won the 6-woman, 1-meter shootout competition that did not include points. • Using prelims results from the invitational as part of the Georgia vs. N.C. State meet, Ryan was first on 1-meter with a season-high 315.30 points and second on 3-meter with 321.15. • Helped the Lady Bulldogs improve to 7-0 on the season and extend their UGA all-sports record with their 87th consecutive win at home. • In Georgia’s win over N.C. State, won one individual event, claiming the 500 freestyle with a time of 4:50.80. • Also placed fourth in the 100 backstroke with a time of 56.88. • Swam on the 200 medley relay (1:44.90) and 400 freestyle relay (3:30.81) that both came in fourth.